Homelessness is on the rise in Central Maine, and the need for emergency shelter has never been greater in the Capital area. Bread of Life Ministries operates adjacent shelters for families and veterans, which together provide roughly 13,000 bed days per year. Sadly, it's not enough. Bread of Life is forced to say 'no' to roughly 600 phone calls per year from our neighbors seeking shelter. Their capital campaign's mission to "Never Say No Again" will ensure that no one is left out in the cold. Bread of Life Ministries turns away about 180 individuals/families seeking shelter every year. 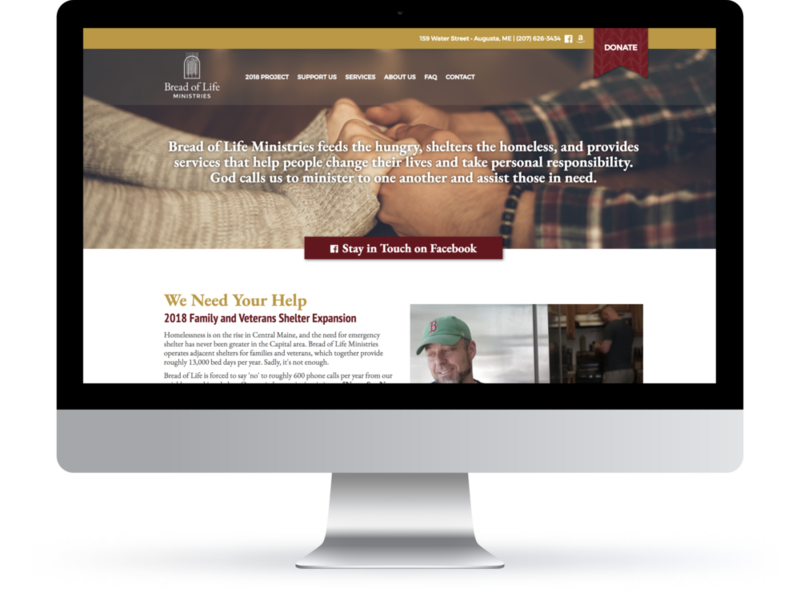 Their redesigned website highlights the services they provide to the homeless of our community and ways in which individuals and organizations can support Bread of Life Ministries in their important work. Thirty-four years ago, community members offered their gifts of time, money, and expertise to make the Bread of Life Soup Kitchen a reality. The kitchen is still serving meals to hungry souls today with the help of dozens of volunteers. Hear the story of a formerly homeless veteran who, through the help of the Bread of Life Ministries, is giving back to his community serving meals every week.